Georgia Senator Johnny Isakson toured the Red Cross shelter at Lakeview-Fort Oglethorpe located 15 minutes west of tornado-damaged Ringgold. “This represents the greatness of the capacity of the people of Georgia to come together and help Georgians who have been hurt”, said Isakson. The Senator spent time visiting with shelter residents and thanking all the volunteers, including many Red Cross workers. This shelter housed 107 people the night of the tornado and 86 the night after. It is still open as of 4-30-11. Red Cross worker Colin Downey rode a police-escorted bus into tornado-ravaged Ringgold, GA. The bus was full of travelers who had stopped for the night at Ringgold motels. This was the first time they had seen their cars since evacuating Wednesday night. Don “Goose” Fortenberry celebrated his birthday the same day a deadly tornado ripped through Ringgold, GA, where he’s lived his entire life. Goose was thankful for his safety and for the responders including the American Red Cross. Help support Red Cross relief efforts in the South by donating at redcross.org or by becoming a Red Cross volunteer. Check out this amazing photo taken by Red Crossers in Tuscaloosa, Alabama. Thankfully, they are okay and helping those in need. 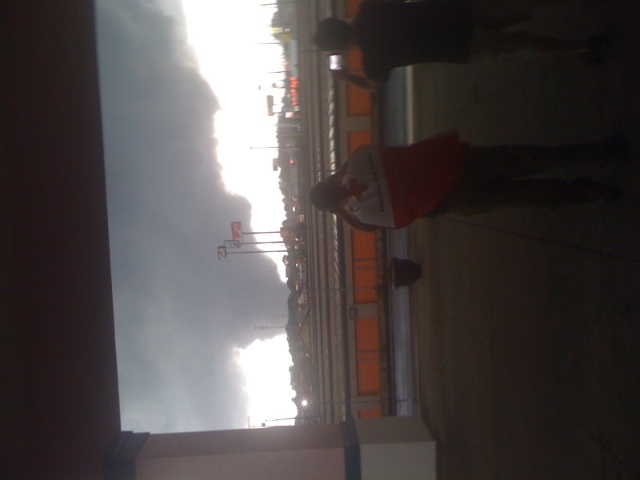 Alabama Red Crossers look on in amazement at Tuscaloosa twister. Thankfully, they are ok.